It’s amazing how much peoples’ lives change after having kids. For example, our movie selections. Do you remember watching movies with adult humor without giving it a second thought? Those days are gone…for now. As a reward for good behavior, my daughter received the movie “High School Musical.” She is hooked on movies with singing and dancing, and she even has her first celebrity crush on Zac Efron. Who could blame her? During a scene in the movie, one of the guys on the basketball team confesses to have a passion for baking, which included scones. It hit me. “I’ve never made scones, let alone even tasted one before.” My husband looked at me like I had crabs crawling out of my ears. It was time to fix this problem. After making these, I became hooked. Once the flood gates are opened, I might as well grab a life boat because the ideas start flowing like the Amazon River. 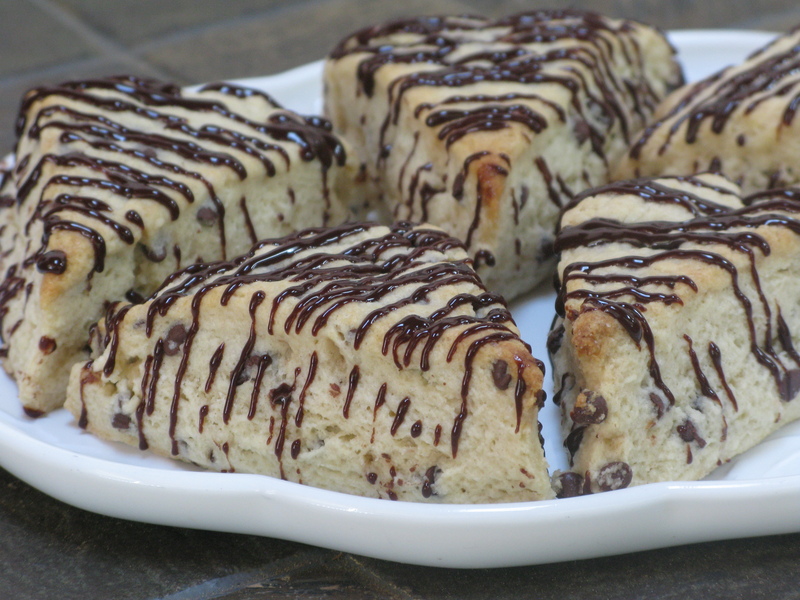 Yes, a river of fluffy, buttery scones drenched with chocolate ganache and vanilla glaze. I can hardly wait to throw myself into that river of sweet goodness. Preheat oven to 400 degrees. In a medium bowl, whisk together flour, sugar, baking powder, baking soda and salt. Cut the butter into the flour mixture using a pastry tool; then use your fingers to continue to work in butter (mixture should resemble coarse meal), then toss in chocolate chips. In a small bowl, whisk sour cream and egg until smooth. Using a fork, stir sour cream mixture into flour mixture until large dough clumps form. Use your hands to press the dough against the bowl into a ball. (The dough will be sticky in places, and there may not seem to be enough liquid at first, but as you press, the dough will come together.) Place on a lightly floured surface and pat into a 7- to 8-inch circle about 3/4-inch thick. Use a sharp knife to cut into 8 triangles; place on a cookie sheet (preferably lined with parchment paper) or baking stone, about 1 inch apart. Bake until light golden, about 15 to 17 minutes. Cool for 5 minutes and serve warm or at room temperature. In a small bowl, stir together powdered sugar, cocoa, vanilla and milk. 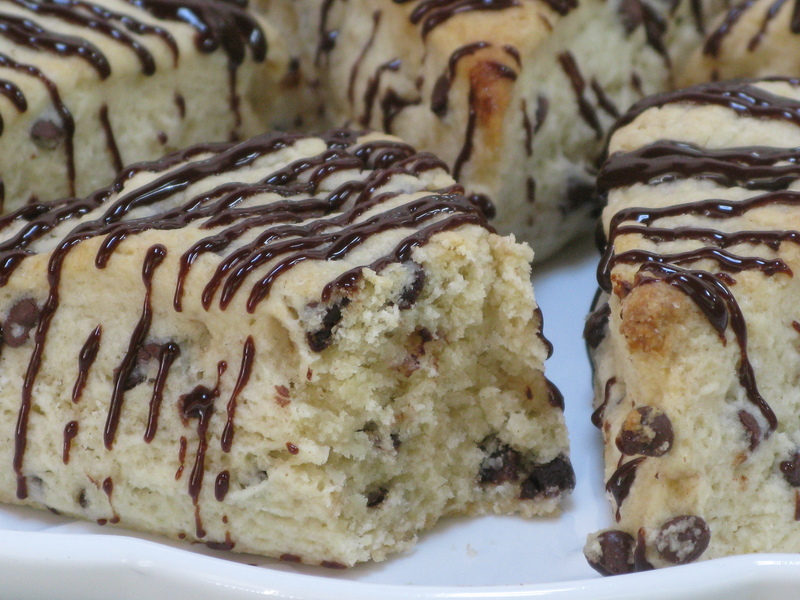 Drizzle over scones. Store scones in airtight container at room temperature.